One of the greats of Tomiki Aikido died on 5pm Sunday, August 8 2010 at the age of 86 after battling with pancreatic cancer. Yamada Shihan was a direct student of Kano, Ueshiba, and Tomiki, achieving 6th dans in both Judo and Aikido. Senta Yamada was born in Fukuoka, Japan in 1924. As a Graduate of Kobe Marine University he began to practice Judo in middle school, and received his 1st Dan at the age of 16. He became an outstanding competitive judoka, eventually reaching the rank of 6th Dan under the founder of Judo, Dr Jigaro Kano. Yamada sensei’s name appears along side the famous in the historic Sekiryu Kan Dojo, as one who completed the session of 1000 throws. He began studying Aikido in 1948 at the age of 24, already a 5th dan in Judo. Dr Kano sent Yamada sensei to study Aikido with Morihei Ueshiba Sensei after the war. As a live-in student he began private training with the founder in Wakayama Prefecture. Shortly after he began to study with Tomiki, who at the time was the most senior student of Ueshiba. Through his training and association with these great men, Yamada Sensei has obtained knowledge and insights into the art of Aikido and Judo that few, if any, persons have today. Yamada Sensei’s mastery of the art, his efficient and powerful body movement and his natural teaching ability was inspirational. 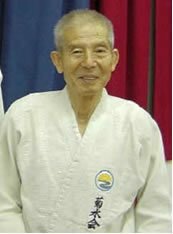 Yamada Shihan originally came to the U.K. in 1959, Teaching Judo at the London Judo Society and also he founded the Kikusui Kai Dojo and taught Aikido and Judo there until 1965. Among the Aikido dan grades promoted by Yamada Shihan during his time in the U.K. were John Waite, John Wilkinson, Bill Lawrence, and Dr. Lee Ah Loi. Many of Yamada Shihan’s original students went on to become great teachers in their own right, It cannot also be forgotten that he contributed greatly to Judo in the UK by leaving us with John Waite and Cliff Baker-Brown both also outstanding Judo players. In 1961 he first published his book “THE ANCIENT SECRETS OF AIKIDO”, this was reprinted in 1962 and then revised and reprinted in 2004. His book published jointly with Alex Macintosh in 1966, “The Principles and Practice of Aikido”, was the first extensive presentation of Tomiki Aikido in the English language and is currently out of print. Yamada sensei left England in 1965 leaving his original students to carry forward his inspiration. He returned to the UK on many occasion to see the classes of many students (now instructors in their own right) who owe there own grades to the people that Yamada San left behind. I myself owe my own Judo grades to John Waite and Cliff Baker Brown and Aikido Grades to Don Bishop, with out the original teaching of this great man many of the current Judo and Aikido players would not exist.